What happens when you lock your bike to a tree? You you pay a hefty $1000 fine if you live in downtown New York. 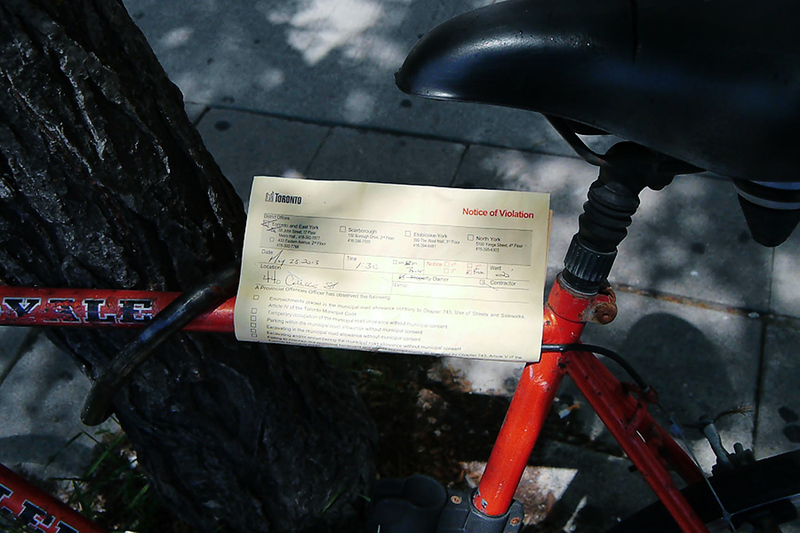 Here in Toronto you get a notice from the city to remove it within 24 hours or they will do it for you. There’s also a double whammy to consider. Unfortunately some people approach a city bike rack as if armed with sickle walking into a harvest. Small trees won’t stand a chance against this onslaught. Landscaping projects can quickly be transformed into something reminiscent of a Tim Burton movie. Nor will it prevent some bike thieves who will just saw down the tree. So what happens to the abandoned bike when the city cuts it loose? It’s brought to a waste depot where it will undergo processing, packaging and shipped to the forsaken town of Innisfil for auction. Others will meet an undignified end, stripped of rubber and plastic, the frame crushed and melted into tiny metal cubes. Both bike and tree deserve a better fate. Previous PostHow to avoid getting "doored"